Recently, my friend sent me a video link on Youtube about a special kind of exercise called "Super Brain Yoga"
India, the land of billion yogi's is rich in Spiritual and ancient Vedic science. Our Spiritual identity reflects in our tradition and culture of our country. "India will be the Guru of the world" so said Swami Vivekananda and Sri Aurobindo in the early decades of the 20th century. That was the time when India was totally subjugated to the British and nobody could dare to think of Indias superiority in any field. Even after 40 years of Independence, many Indians continued to think of India in inferior terms. That situation has changed and now India is emerging as a knowledge power. Thoppukaranam is a traditional practice in Indian Schools, accepted from Gurukula system of education right from Sannipani Ashram(Sri Krishna's time) to make the child sit and stand catching both the ears with hands crossing each other symbolising punishment for lethargy, laziness and not memorizing or grasping and to improve brain power etc. Though it has degenerated into a punishment, the reason for giving such punishments were exactly to improve the brain power of the child. Most people do it infront of idol of Hanuman, Ganesh and Murukan. There it is more than improving the brain power, it is a request to enlighten. Science only reinvents. A simple devotional action performed by Hindus in front of Lord Ganesha or Ganapathi from time immemorial is now being researched and enthusiastically promoted and registered in the West as Super Brain Yoga. Students, Alzheimers patients and adults trying to stave off memory loss are saying it has improved their mental faculties. There are many ways to boost the brain power through yoga and other techniques like piercing which is popularly knows as Karna-Vedha. Knowledge of the seer and the seen is the great message of Ganapathi "Ga" means Buddhi (intelligence). 'Na' means Vijnaana (wisdom). 'Pathi'means master. 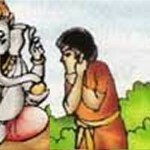 So, Ganapathi is the master of all knowledge, intelligence and wisdom. There is also another significant meaning for the word, that He is the Leader of all the Ganaas who are celestial. He is also called Vinaayaka, which term means that he is one who has no master above Him. He is the Supreme master. He is beyond the mindless stare. One who has stilled the mind cannot have any master. Let us be proud of our culture and hold our head high. Let us be proud to know that the world is trying to learn what our forefathers have introduced several thousands of years ago. All my Grandparents stories are making sense to me now!! !